Reverend Dr Angus Morrison has said he is 'amazed and deeply moved' at his selection as new Moderator of the Kirk. The newly selected Moderator of the General Assembly of the Church of Scotland has said he is "amazed and deeply moved" at the selection. The Reverend Dr Angus Morrison, Minister of Orwell and Portmoak Church in the Presbytery of Perth, became Moderator Designate of the General Assembly on Tuesday. 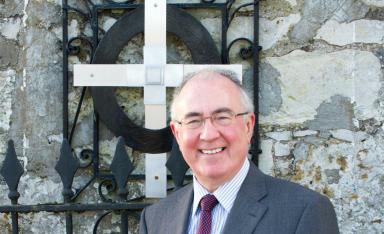 Dr Morrison will take up the office of Moderator in May 2014 at the General Assembly of the Church of Scotland. Dr Morrison was born in Glencoe in 1953. His father worked for the Northern Lighthouse Service and he went to school in Oban, Stromness and Edinburgh before leaving school and studying at the University of Glasgow. He undertook further studies at Pisa University and London University before a PhD at Edinburgh University. Dr Morrison said: "I really am amazed and deeply moved to have this honour laid on me. I am truly humbled by the trust that has been placed in me. I shall do my utmost by God’s grace to prove worthy of it. "It is my great desire to encourage the Church in its vital God-given mission to the people of Scotland and beyond. In these troubled times the peace and unity of the Church are dear to me and I shall endeavour to promote them in every way I can." Dr Morrison’s church career began in when he was ordained in the Free Presbyterian Church of Scotland in 1979 but after ministries in Oban and Edinburgh he transferred to the Church of Scotland, became the minister of St Columba’s Old Parish Church in Stornoway and is now Minister at Orwell and Portmoak Parish Church. During his time in the Church of Scotland he has made a significant mark, serving as a member of the Church and Nation Committee; Chaplain to the Queen; Convener of the Mission and Discipleship Council and Moderator of the Presbytery of Lewis. Dr Morrison, who has a degree in Classics and speaks Italian and Gaelic is married to Marion, a primary school teacher in Fife. The couple have four children between the ages of 16 and 27.